Thank you for supporting UW-Green Bay students! 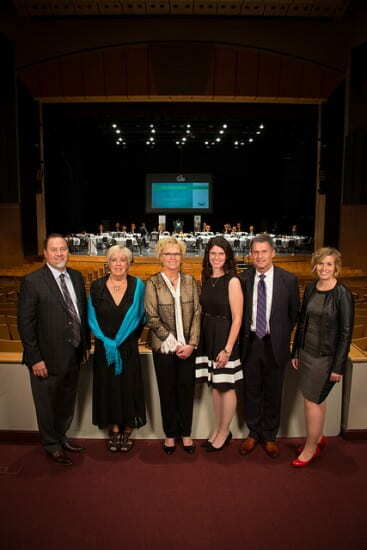 Your Alumni Association strives to provide scholarships to well deserving students at UW-Green Bay. With your contributions, the Association was able to provide scholarships for 15 deserving students this year. 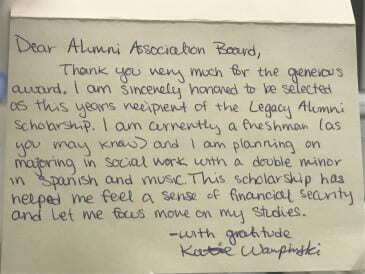 As students sent in thank you notes sharing their thanks and gratitude, we wanted to share them with you and thank you for helping us provide with these wonderful scholarships for UW-Green Bay students. Click here to view some of the thank you notes and see the great impact your contributions are making! 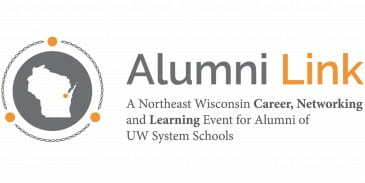 This entry was posted in News and tagged alumni, Making a Difference, scholarships, Thank you, UW-Green Bay on January 18, 2018 by moodyk. This Commencement Speech needs a listen! 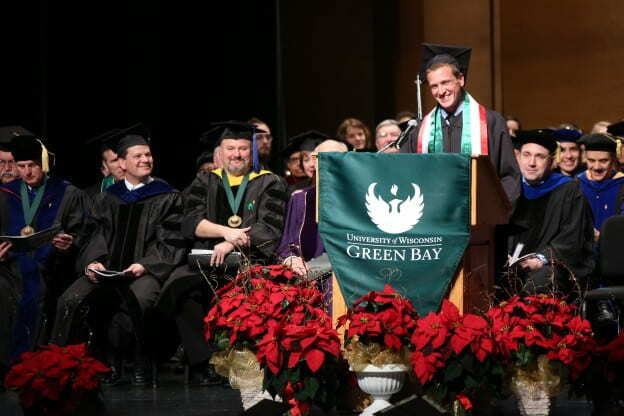 Riley Garbe first came to UW-Green Bay as a fifth-grader on a Phuture Phoenix field trip, where a visit to the campus turned into a dream of one day graduating from college. Despite surviving a difficult childhood that included witnessing abuse and violence and moving from home-to-home, Garbe entered the University on a Phuture Phoenix scholarship. He was recognized by the Alumni Association as the University’s Most Outstanding Student at the Fall 2017 Commencement. He was also nominated and selected from all graduates as the student commencement speaker. Riley’s Commencement speech is definitely one worth listening to! Here are his remarks to his fellow graduates, which were interrupted by applause and drew an emotional standing ovation from fellow classmates, friends and family in attendance. This entry was posted in News and tagged alumni, Commencement Speech, Riley Garbe on January 17, 2018 by moodyk. It was so much fun; we’re doing it again! 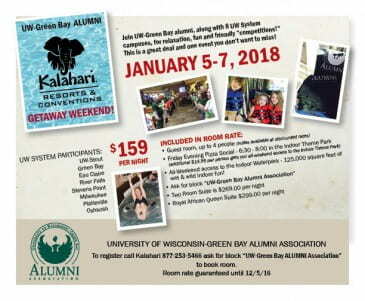 Join UW-Green Bay alumni, along with eight UW System campuses, for fun and relaxation at the Kalahari Resort and Waterpark Friday through Sunday, Jan. 5 through 7. This is a great deal and one event you don’t want to miss. Friday night will include an all UW pizza party. Be sure to wear your UWGB gear and show your Phoenix pride. Saturday, swim the day away in the water park or just have good ole fun at the amusement park. This is a “bring your family and friends” event. 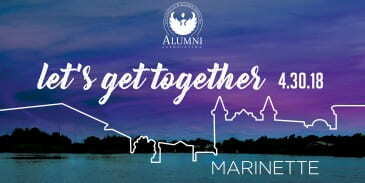 To make reservations, please call 877-253-5466 and ask for the UW-Green Bay Alumni Association room block with a rate of $159 per night. Reservations must be made by Tuesday, Dec. 6, 2016. Reserve today. All-weekend access to the Indoor waterpark – 125,000 square feet of wet & wild indoor fun! We hope you can join us for this fantastic weekend of fun! 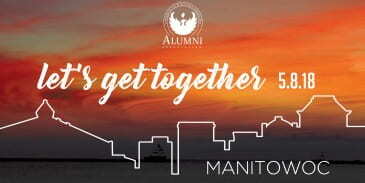 This entry was posted in Events and tagged alumni, Alumni Family Gatherings, Alumni Weekend, event, phoenix on November 20, 2017 by moodyk.